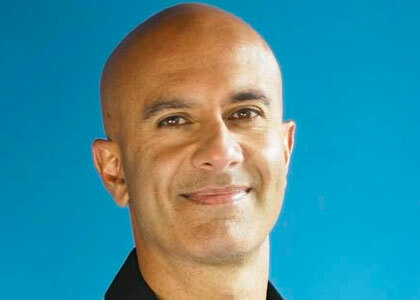 Robin Sharma is the celebrated author of 15 bestselling books on leadership, including The Leader Who Had No Title (Simon & Schuster), one of the bestselling business books on the market today. His work has been published in over 62 countries and nearly 75 languages, making him one of the most widely read authors in the world. He shot to fame with The Monk Who Sold His Ferrari which has topped international bestseller lists and sold over 4,000,000 copies. Celebrity CEOs, rock stars, top entrepreneurs and royalty have all embraced his work. As well as being a much sought-after speaker globally, he is also a widely respected CEO advisor having worked with Fortune 500 CEOs and leaders all over the world. Sharma is the founder of Sharma Leadership International Inc., a training firm with only one focus: helping people in organisations Lead Without a Title. Clients include many of the Fortune 500 including Microsoft, Starbucks, the Coca Cola Company, GE, Nike, FedEx, and IBM. Organisations such as NASA, Yale University and The Young Presidents Organisation are also SLI clients. In a recent independent survey of 22,000 business people he was ranked in the Top 5 leadership experts (source: leadershipgurus.net). He frequently shares the stage with Richard Branson, Jack Welch, Jeffery Immelt, and thought leaders such as Bill Clinton. Sharma is profiled regularly on leading international media such as CNN, MSNBC, BNN and the Biography Channel. His book The Leader Who Had No Title (Simon & Schuster) is a runaway business bestseller and was the #1 business book at Amazon.com. In addition, robinsharma.com is one of the most popular resources on the Internet for leadership content, and offers his blog, robinsharmaTV, along with his acclaimed e-Newsletter: The Robin Sharma Report. Sharma is known as a ‘leader to leaders’ and has become one of the most trusted advisors in the world on leadership. He holds 2 law degrees including a Masters of Law and has had a distinguished career as a litigation lawyer. Many CEOs and senior executives of the Fortune 500 and other organisations turn to him for advice and counsel on leadership, change management and high performance in business. Robin is legendary for his dynamic, results-oriented, inspiring and hugely practical presentations that lead to measurable results. In his keynotes and seminars, Robin blends a powerful delivery style with a gift for storytelling and connecting with audiences in a way that moves them to action. His sessions are high in content that your people can use immediately for greater success and effectiveness. Sharma is also the driving force behind The Robin Sharma Foundation for Children, a non-profit organisation that helps children in need become leaders.